One of the most important benefits of LinkedIn is the ability it gives you to find people outside your existing professional network. But once you find them, how do you connect with them? 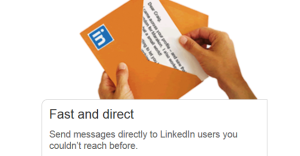 When you’re a first-degree connection with someone, LinkedIn provides you with that person’s email address and lets you send a message to them directly through the LinkedIn interface. But since first-degree connections are usually someone you actually know in real life, you probably already have this information. This is fine if you already know or have worked with the person. But when you click the Connect button, you’re asked how you know them. If you choose Colleague, Classmate, or We’ve Done Business Together, you will be asked to pick from a dropdown list of jobs or schools you’ve listed on your own profile and that information will be used in the message that goes to the person you’re inviting. NOTE: In 2015, LinkedIn changed the rules for sending 1-1 messages to fellow group members (I think there was too much spamming going on). You can only send 15 messages to group members a month (across all groups). So Groups no longer appears as an option on the Connect screen. If you pick Friend, you won’t have to pick anything but, again, the email they receive will say that you have said they were a friend. If you’re not, that person may not really want to connect with you after you’ve lied about your relationship. If you say Other (e.g. maybe you met at an event), you will be asked to provide that person’s email address to prove that you really have connected somehow with that person. But if you’re just trying to send them a message and you already have their email address, then you don’t really need LinkedIn at this point. And if you’re honest and admit you just don’t know this person, you’ll be greeted with this message if you try to Connect. So none of these methods are really helpful for connecting with people you don’t already know. InMails are emails you can send to anyone on LinkedIn. The catch? You have to pay for them. Of course, depending on why you want to reach the person, this might be totally worth it to you. Unfortunately, if you click the option to send an email, LinkedIn immediately asks you to upgrade to another plan. The different packages will include different number of InMails you’re allowed to send. As you can see, the cheapest version that includes InMails is $29.95 a month, which includes 3 of them. This might be worth it if you currently want to contact three people you don’t know. The problem is, you can’t pay on a month-to-month basis. So the $240 you’ll be charged to upgrade is probably a little steep just to send one message. UPDATE: LinkedIn has stopped allowing people with the free Basic service to send InMails at all. (Ugh.) However, they do now let you purchase a premium plan on a monthly basis (and they have a 30-day free trial option). And if you are a premium subscriber, you can purchase up to 10 additional individual InMails for $10 each. So this may be an option for you if you desperately need to contact people and can send them all within the same month. Also, as mentioned in another update below, they will now re-credit you with an InMail if you receive a response from the person you contacted so you could end up more. I’m not sure what happens if the person responds to you after your subscription is up. If you do want to purchase additional InMails, here’s how you do it. Roll over your picture at the top right and select Privacy & Settings. You can also just go to www.linkedin.com/settings when you’re logged into your account. Click Purchase under the InMails section. A popup appears and you can purchase 1, 3, 5, or 10 InMails. There’s no discount for multiple purchases, so why you can’t by 2 or 4 or 6, etc. is unclear to me, but there it is. Note: If you send an InMail and don’t get a response after 7 days, you’ll be able to use that one for another person. So if you have multiple people you want to contact and they don’t all have to be at once, you may just want to purchase one and wait to see if you hear back from the first person before purchasing one for the next person. In January 2015, LinkedIn is changing their policy. Now you won’t get a refund if the recipient doesn’t reply to you. Instead you’ll now get a refund if they DO reply (within 90 days). I think when they first offered refunds for InMails that weren’t responded to, they were thinking about the sender who might hesitate to pay if they thought nothing would come of it. But in practice, they probably received a lot of spam complaints from the recipients and the new policy rewards people for using the service responsibly. I think that makes sense. You’ll be taken to the screen to enter your payment information and then you can continue through to confirm the info and then get your receipt. When you return to your Settings page, the number of InMails you’ve purchased are now displayed. Note: InMails expire in 90 days if you don’t use them. Now when you click the Send InMail button on someone’s profile, you’ll be taken directly to a message form. Note that when they receive your message, it will give them access to your profile as well so make sure it’s up to date and gives them a reason to want to reply to you. IMPORTANT: You’ll see on the message form that it lists what the person is interested in receiving communications about. Most people have accepted the default list. But if someone has taken the express action of removing something from the list (e.g. job inquiries), those options will not appear in the Category dropdown box. I strongly recommend you do NOT send them a message under another category as that could get you reported to LinkedIn (plus, as with the relationship situation mentioned above, it’s never a good business practice to lie to people you want something from).